Apex Messages in Salesforce are used in displaying messages in standard visualforce pages, unless you are not using the cool frameworks like BootStrap or FlatUI, where you show error messages in a neat fashion. 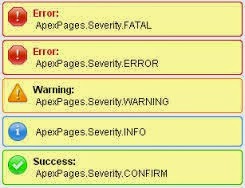 Before we move on, I would like you go through Apex:Severity messages to see what type of severity can be shown on pages and how are they displayed on pages. I designed a simple code snippet that handles all sort of apex messages on visualforce pages at one place for you, you can re-use this code at any point in any custom class and show messages in convenient way. Now I designed a PageHelper class that handles many things but include method that shows the message in modular way, so all you care is calling method with name and pass on message to display on page.